If you want to know how to write, make, and publish your e-book, then get How to Make Money with Ebooks. Discover how to find the right topic that can help sell your e-book. Uncover how to find the best title so your e-book can stand out in the marketplace. Find out how to create great content whether you write it yourself or hire someone else to do it for you. How to sell your e-book on all the major e-book platforms such as: Amazon's Kindle store, Barnes & Noble's Nook store, Apple's iBookstore, Google Play store, and many more. How to market your e-book the right way without spending a lot of money. Gain greater reach, impact, and profits by learning how to scale up your business by creating more e-books the right way. Discover how to outsource your work so the majority of the work (if not all) can be done by others. What's unique about this audiobook? Discover how to sell your e-book on all the major e-book platforms (Kindle, Nook, iBookstore, Google Play store, etc.) instead of just one e-book platform. Learn how to publish your e-book from an e-book publisher and an author's point of view since the author has both experiences. 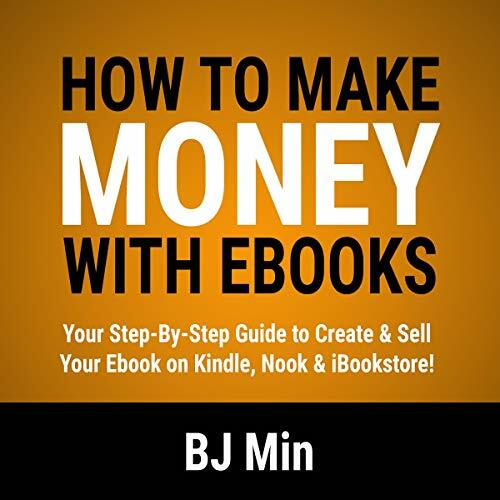 The exact blueprint that has allowed author BJ Min to launch two publishing companies to produce more than 250 e-books in fiction and nonfiction genres. A complete step-by-step formula to succeed in the e-book business. Access to step-by-step tutorials to guide you to get real-life results. An excellent resource for aspiring authors because this audiobook helps anyone publish his or her first e-book on all the major platforms. A comprehensive resource for e-book publishers because this is also a great guideline to starting a publishing company. A fantastic resource for internet marketers and business owners because the e-book platforms are a great way to generate leads for your business.